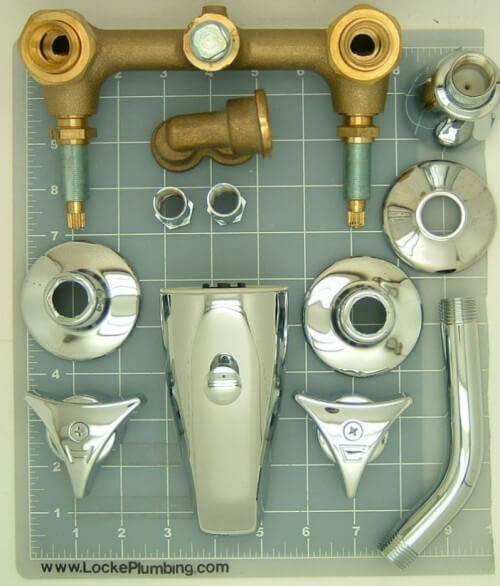 Pam, can you help me find an affordable yet quality tub and shower faucet set in the 1950?s style? I need the hot, cold, and the middle knob for turning on the shower. I looked on Restoration Hardware and EACH ONE is $300-400! We have to get the work done soon, so I’m hoping to find something quick. When I did a Google search it lead me to you…. Thanks for any ideas you have. 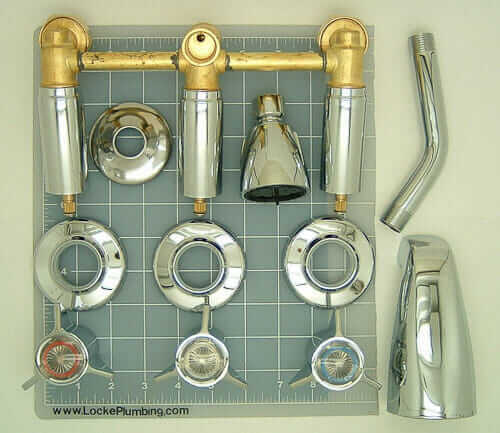 I don’t have any experience relative to their quality, but why don’t you look here –> Locke Plumbing tub-and-shower faucets. They seem to have several three-handle design available, at good prices. Update: Commenter pointed out that these may not be to code any longer — something to do with new anti-scalding designs; please consult with a licensed professional so that you can make an informed decision about this issue. Locke Plumbing was a tip from Russell a few years ago. 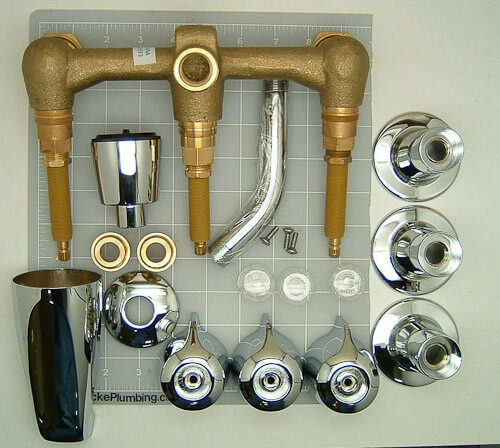 Remember Russell… of the “Seabee House.” Oh my, aren’t these three handle tub-and-shower faucets sets just beautiful to behold. Like sculptures. I like the look of the Sayco — the very first set — in particular. Actually, I love it. But I am like that about chrome and brass and plumbing in general. When I was a kid, roaming around the hardware store was my favorite. So of course, I spent a whole hour roaming around the Locke Plumbing site in general. Remember: Russell’s initial recommendation of Locke was as a place to find parts. I used to do apt. maintenance in a building old enough to have 3 handled faucets. There’s a place here in Lansing, MI -Jakes Plumbing- where you can get parts to rebuild the originals. He might even have a few of the old bodies. 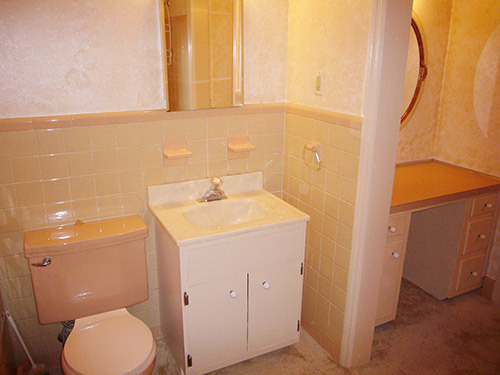 Jakes also has some old toilets and sinks – various colors. If you’re doing the work yourself be sure to pack the escutheons (big chrome rings that cover the holes) with plumber’s putty. That will keep them from rusting. What beautiful sets. Wish I needed one. 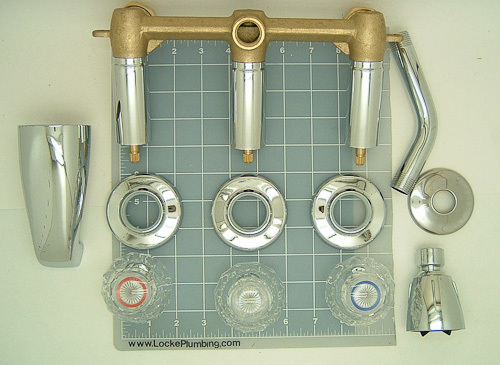 However; I do need a sink faucet & went to the Locke Plumbing site & purchased a discontinued Delta I have been looking for. Put my order in anyway. Hopefully they still have it in stock since they indicate supply is limited. Thanks for reminding me about Locke Plumbing! Why didn’t I find this site sooner???!!! !Ouch again. I needed new fixtures for the tub in my early 70s house. I was in a hurry with lots of family issues and didn’t catch that the set i chose from a sample high on the wall at Lowe’s wasn’t made of metal. The box was too light for metal, and I didn’t even realize….dum…dum. Gave the box to the plumber and moved on to tend to other situations. When I went back to check on the job, the guy was on his back with his head under the cabinet, installing ‘plastick-y’ piping after cutting off all the metal he could reach (which disappeared from the house when he left). It look like H*** inside the wall. And the fixture rings don’t stay against the tile wall properly. I was stunned to see the chainsaw massacre job he did and could have sat down and cried. I’m wondering if it’s worth a do-over. I want to sell the house and am hoping the new fixture shine will win out over the deficits. Faint hope. I think I’m going to cry again……right now. Then i’m going to look at the great links you all have provided…..and have another good cry. Maybe I’ll get over this one someday. And maybe not……..